-This module integrates control of Telos Hx6, Nx12, Nx6, TWOX12, Series 2101 and VX telephone systems right into the console. -2-fader telephone control module features integrated Telos Call Controller with Status SymbolsTM. 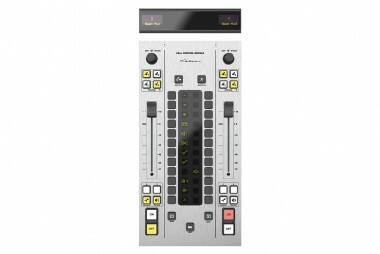 -Rotary Options Control knob can be programmed to trim source or fader gain when turned; invokes Options screen when pressed. Fusion consoles require a power supply and mixing engine. Fusion may be used with either a separate Fusion Power Supply and Studio Mix Engine, or the PowerStation all-in-one power supply/mixing engine/audio I/O center. Redundant power is available with either mix-engine platform. PowerStation users may add a PowerStation AUX with auto-switching backup power supply and additional I/O. StudioEngine users may connect a second Fusion Power Supply directly to the console for auto-switching, redundant backup power. -High-resolution OLED alphanumeric channel displays give complete information on source assignment, channel options and more.